Bolivia is located in central South America. Bolivia is bordered by Peru and Chile to the west, Brazil to the north and east, and Paraguay and Argentina to the south. Google Earth is a free program from Google that allows you to explore satellite images showing the cities and landscapes of Bolivia and all of South America in fantastic detail. It works on your desktop computer, tablet, or mobile phone. The images in many areas are detailed enough that you can see houses, vehicles and even people on a city street. Google Earth is free and easy-to-use. Bolivia is one of nearly 200 countries illustrated on our Blue Ocean Laminated Map of the World. This map shows a combination of political and physical features. It includes country boundaries, major cities, major mountains in shaded relief, ocean depth in blue color gradient, along with many other features. This is a great map for students, schools, offices and anywhere that a nice map of the world is needed for education, display or decor. 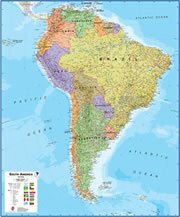 If you are interested in Bolivia and the geography of South America our large laminated map of South America might be just what you need. It is a large political map of South America that also shows many of the continent's physical features in color or shaded relief. Major lakes, rivers,cities, roads, country boundaries, coastlines and surrounding islands are all shown on the map. Aiquile, Camiri, Cobija, Concepcion, Corocoro, Guaqui, La Paz, La Union, Mategua, Monte Cristo, Montero, Oruro, Pedras Negras, Piso Firme, Potosi, Presto, Puerto Suarez, Riberalta, Robore, San Borja, San Javier, San Josede Chiquitos, San Lorenzo, Santa Ana, Santa Cruz, Santa Rosa Del Sara, Sucre, Tarija, Trinidad, Tumupasa, Uyuni, Versalles, Viacha, Villazon and Yotau. Beni River, Cordillera Central, Cordillera de Chichas, Cordillera de los Andes, Cordillera Real, Lago de Coipasa, Lago de San Luis, Lago de Titicaca, Lago Huaitunas, Lago Poopo, Lago Rogagua, Lago Rogaguado, Laguna Concepcion, Mamore River, Pacific Ocean, Rio Abuna, Rio Beni, Rio Benin, Rio Chapare, Rio Desaguadero, Rio Grande, Rio Madre de Dios, Rio Mamore, Rio Pilaya, Rio Plcomayo, Rio San Pablo, Rio Yacuma, Salar de Coipasa, Salar de Empexa and Salar de Uyum. Metals are Bolivia's most important mineral resources and include tin, zinc, tungsten, antimony, silver, iron, lead and gold. Other resources include natural gas, oil, timber and hydropower. 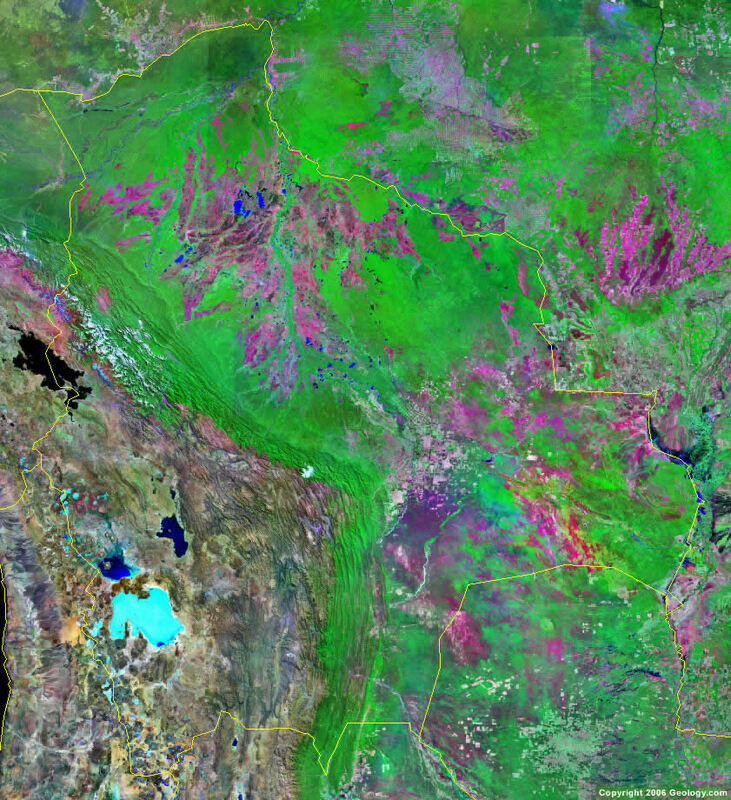 Flooding occurs in the northeastern portion of Bolivia, during March and April. Bolivia has many environmental issues concerning the land. There is deforestation, which is occurring from international demand for tropical timber, and the clearing of land for agricultural purposes. There is soil erosion from poor cultivation methods (including slash-and-burn agriculture), overgrazing, and desertification. These land issues have resulted in a loss of biodiversity. Bolivia's water supplies, used for drinking and irrigation, are also affected by industrial pollution.